Yesterday was the seventh day that I had been sick with the mother of all head colds. I had eaten soup every single day for those seven days. As much as I love soup, I had absolutely had it. No more soup for me. I was beginning to feel better and I wanted solid food. Comfort food! At 10:30 a.m., feeling very ambitious, I decided I would make meatloaf and mashed potatoes for dinner. By 2:30 p.m. I decided that all I really wanted to do was go back to bed and have someone cook for me, which is when I remembered Chef Loryn’s Cafe. Chef Loryn’s is tucked into a tiny corner on Main Street. One could easily miss it if not for the sandwich-board sign on the sidewalk. Although the space is tiny, with just a couple of tables and a table or two out front in nice weather, it’s a space to linger and catch up with neighbors, or Chef Loryn herself, who is often seen taking stock behind the counter and running the kitchen. We have had sandwiches, soups, and salads to-go from Chef Loryn, all delicious. My favorite is the turkey sandwich on a multi-grain roll with stuffing, lettuce, cranberry sauce, and mayo (ask for it with raw onion – it’s fantastic). A runner-up is the flank steak on a pumpernickel onion roll with grilled onions, lettuce, and horseradish cream. Soups are hearty, and some could be called stews. But honestly I haven’t gotten to a third of the things I’d like to try, just because I’m stuck on that turkey sandwich. Filled with vegetables and chicken. Every Wednesday Chef Loryn’s sandwich board says it’s chicken pot pie day. Every week I get an email telling me to pre-order my chicken pot pies. 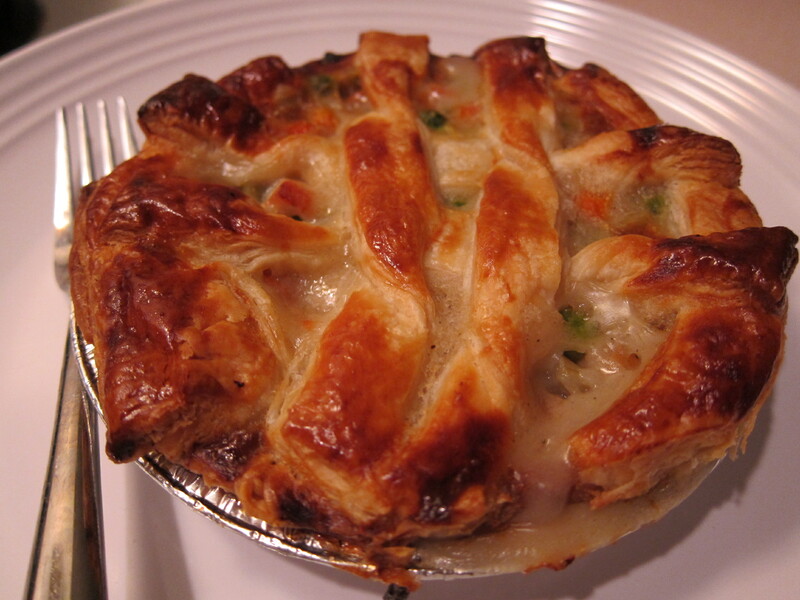 Every time I’m in Chef Loryn’s, I see someone picking up chicken pot pies. Well, it was Wednesday, and hoping I wasn’t too late, I placed the call. Chef herself answered and said, “You’re in luck. I have eight left.” Restraining myself from cornering the market, I ordered three. When I went to pick them up, she said she had made 108 of them, and they were all sold out. In the winter months she will make more and sell all 150 of those, and I can see why they are so popular. 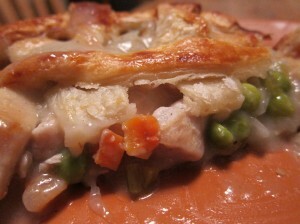 They have a classic puff pastry crust, filled with plenty of carrots, peas, celery, and big chunks of chicken. My only regret is that the gravy has a cornstarch-sheen and stickiness to it, but the flavor is what it should be and it hit the comfort-food spot. I also purchased a side-salad, but one pot pie each was more than enough. At $7.00 per pie, it’s a great deal for a fast, warm dinner. To heat the pies, preheat the oven to 350 degrees F. Bake them in their foil on a sheet pan for 20 minutes. Remove the foil and bake another 10 to 15 minutes, until the pastry is brown and you can see some bubbling on top. Visit Chef Loryn’s website and sign up for the mailing list. You’ll get a weekly email of dinners available for you to pick-up throughout the week, which include dishes like meatloaf, chicken cordon bleu, and jumbo lump crab cakes, all served with accompanying sides. Breakfast is also available, as is catering. Update 3/30/10: This morning I received an email from Chef Loryn that the store suffered a fire. Thankfully, no one was hurt. The store will be closed for a while while they make repairs. They will be honoring all catering contracts. I wish Chef Loryn and her staff the best of luck, and will update this page as soon as they reopen. Update 6/21/10: Still no news. I did send an email asking for information but have not heard back. Every now and then there’s a truck outside. I hope that means there is progress and she’ll be reopening soon. Update 10/27/10: Chef Loryn’s is back in business as of today! This entry was posted on Friday, March 26th, 2010 at 7:04 pm	and is filed under Takeout and Catering. You can follow any responses to this entry through the RSS 2.0 feed. You can leave a response, or trackback from your own site. Just wanted to say thanks for this nice piece! This is the first time I have seen it!!!!! Thank you so much!!! Feel free to write some more!!!! !